We meet at a Malibu coffee shop, 8:45 a.m. sharp. 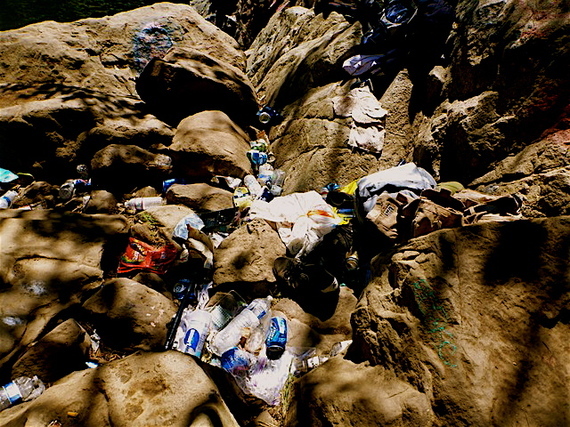 Our mission: Hike down Malibu Canyon and collect the trash congesting the freshwater riparian habitat around Malibu Creek's Rindge Dam. Like most acts of voluntarism this is a labor of love. The goal is to get the discarded plastic and glass bottles, boogie boards, swim noodles and beach chairs, abandoned socks and shoes (some in pairs), t-shirts, towels and a sea of cigarette butts, before seasonal rain washes this detritus into the Pacific. Malibu Creek drains into the ocean at legendary Surfrider beach (think Gidget and the 1990's longboard surfing revival) just 3 miles downstream. Remnants of a damn good time. Photo: Resource Conservation District of the Santa Monica Mountains. This is a truly preemptive "beach/ocean clean-up" -- disposing of all this crap inland before it even gets to the coastline -- where it could join the millions of tons of flotsam and jetsam already stifling marine ecosystems. In the northern Pacific Ocean fish ingest up to 24,000 tons of plastic annually. But forget the thoughtless littering left by those wanting to perfect their "gainers" at officially off-limits Rindge Dam, the culprit causing real habitat fragmentation and ecosystem strangulation is the 100-plus foot concrete backdrop to all the fun -- the dam itself. Construction of dams was done with the best of intentions: to generate hydroelectric energy (once half of U.S electricity supply) store water, and protect from flooding. Turns out, though dams felt like glorious American progress in the first half of last century, we are now experiencing the downside of interfering on such a massive scale with the natural order. Dams flood, bifurcate and often destroy the ecosystems they occupy and displace. In fact these days only pre-existing, small -- 30 megawatt or less -- hydroelectric generating dams are even considered renewable energy sources. Rindge Dam is one of 1,400 such water barricades erected in California between 1850-1970. Built by May Rindge, once the owner of most Malibu real estate, this private damming of Malibu Creek irrigated her lima bean crops. But flowing water transports sediment, arrest water flow and the sediment settles out right into your artificial reservoir. Sediment's damming-of-the-dam potential means most dams have finite life spans. In fact Malibu Creek is SO sediment rich that Rindge was clogged by the stuff and rendered defunct by 1955. Built in 1926, the dam was decommissioned after less than 30 years of active duty -- this size dam should operate for 90 years. But sediment is particularly problematic in tectonically active California where terra firma is NOT that firm. The state's geologically busy and steep coastal terrain means waterways carry heavy sediment loads. Which brings us to the other issue with sediment and dams -- sediment is blocked from getting where it's supposed to go. In California, annual pre-dam sand delivery to beaches is estimated at 10 million cubic yards. Coastal watershed damming reduced nature's replenishing mechanism by 25 percent. The most dire -- 50 percent less sand deposition -- happens in southern California. Water coming out of dams is so sediment deprived they call it hungry water. Hungry water travels faster and has more erosion capability -- not good for anything downstream -- such as sand starved beaches. That southern Californian beaches are eroding is no news to Malibuites. Expensive and ecologically unsound sand re-allocating projects have been tried, and are still seen as the answer to threatened seaside homes. Another solution could be waiting in them there hills. Right now 800,000 to 1,600,000 cubic yards of trapped sediment sits behind Rindge Dam. That sediment pile contains 90 odd years worth rocks and silt and SAND. Human interference with the natural cycle of sediment deposition is unfortunately an environmental horror movie playing out all over the U.S -- southeast Louisiana is loosing a football-field sized chunk of coastal land every hour. Another cycle of a more personal nature that dams stunt, is anadromous fish species who leave the ocean to travel up rivers to spawn. Manmade fish ladders enabling fish to bypass dams and artificial spawning projects - both designed to mitigate plummeting fish populations - are NOT cutting it. Rindge Dam thwarts the federally endangered southern steelhead trout (Oncorhynchus mykiss) from reaching its old spawning ground. The steelhead has to make do with a tiny portion of its former habitat to accomplish the important business of procreation, and growing big enough to survive life in the ocean. For many, REMOVAL is the only solution for dysfunctional dams. Right now there is something of a dam removal crusade going on. No easy feat in the U.S - truly a dam-Nation - with 2 million small and 76,500 large dams. So far 748 of no longer beneficial dams have been removed, and Rindge Dam is on the list. But removing this dam: situated at the bottom of a canyon; accessed from a busy -- two lane only -- commuter road servicing about 20,000 vehicles daily; near a city of 13,000 (many of them mega-rich) residents; with sensitive native habitat issues; is a project fraught with constricting logistics and conflict. The U.S Army Corp of Engineers and California's Department of Parks and Recreation have the dismantling of Rindge mapped out. It will happen over 5-8 years in careful stages, to cause the least disruption to the area's wild and human life, with a $30-40 million price tag. Hauling out twenty bags bursting with mindlessly discarded debris is a relatively 'small step' in the habitat restoration stakes. 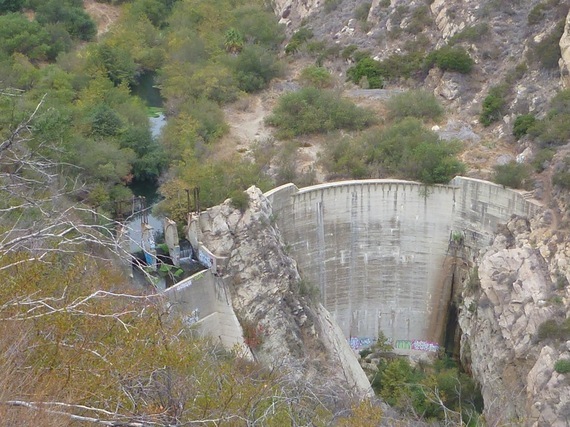 Demolishing obsolete Rindge Dam will be the 'giant leap' in returning ecological balance to Malibu Canyon. Scientists believe steelhead are more likely to survive climate change without the dam. Creek water temperatures will increase along with air temperature, possibly exceeding the steelhead's tolerance range. If they were able to access the deeper cooler parts of Malibu Creek, and also the relatively pristine watershed of Cold Creek, they might survive. Intact, functioning coastal waterways and wetlands will also be one of our best survival mechanisms against what climate change brings to our shores. It's time to damn the dams.